I wrote a little about stash busting in my last post. Ah, the stash. It's incredible how it grows. The trouble is, it's so easy to accumulate yarn quickly, but it takes a long time to use any of it. One shopping frenzy, and you have enough yarn for an entire year. I did a sweep of the stash recently and was pretty ruthless. 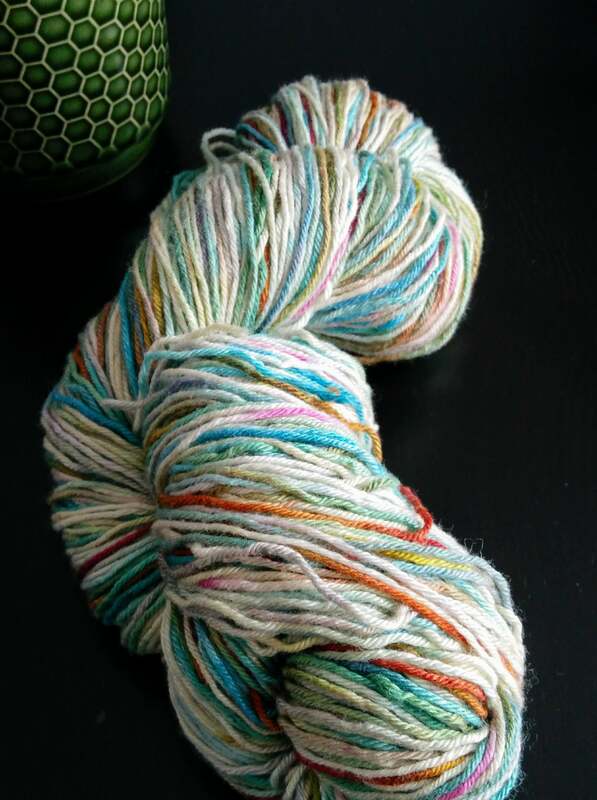 Expensive yarn that I will never use? It goes into the give-away pile. Yes, yes, those skeins were $20 each, but there's no point hoarding them. I might try to tell myself, Maybe the boys will have children, and then those children will grow up and want to knit and they will love this yarn, so I should keep this yarn. But that's foolishness. Into the Give-Away pile with you! Part of being ruthless with a stash is looking at yarn that has already been used. Projects that you finish, or start, and then don't like or it they don't fit or whatever. 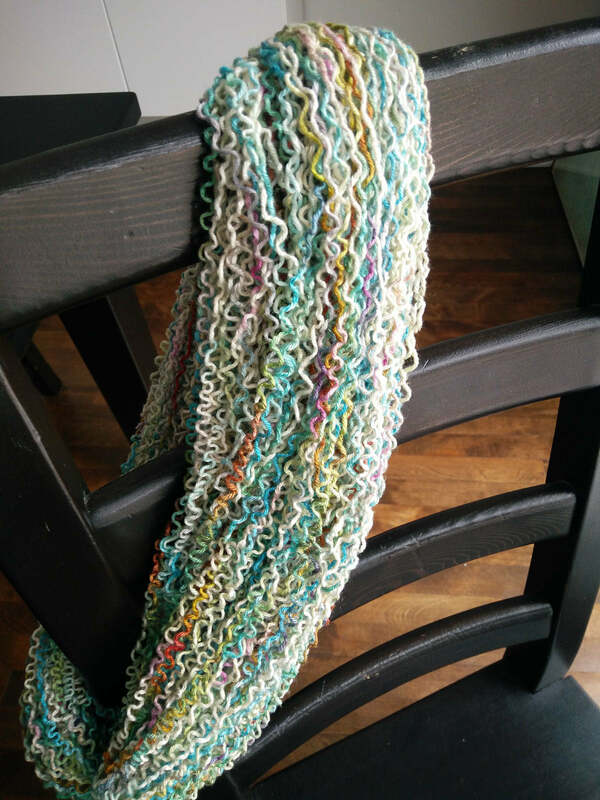 A long time ago, I knit one of my favourite skeins (a handpainted Sweatermaker Yarns skein of 50 merino/50 silk) and turned it into a scarf. The problem is, that I never loved the way the colours pooled, or the width of the scarf. So it languished in a bin in the cupboard. The pattern is the Gingham Scarf (one of my free knitting patterns), and if I'm being honest with myself, this pattern is much more suitable for a medium coloured solid or heather yarn. The colourful hand-dyed yarns just obscure the texture and eyelets in the Gingham scarf. So last weekend, I reclaimed the scarf. It's such a liberating feeling to unravel a project. At first, you feel a lot of reluctance to rip out work; hours of knitting went into that scarf. To unravel something you knit feels like admitting defeat. But it's better to see it as a fresh start. Find the bound off (cast off) end of the piece of knitting. (If this is a project that you pieced together, you must first undo any seams or grafts or picked up edges). If you can, don't cut anything. Look for where the yarn tail would be from the bind off. Pull the yarn tail back through the final stitch of the bind off. Now you should be able to pull the yarn and undo your stitches. Depending on the yarn, the bound off edge can sometimes not undo easily. Don't worry too much about preserving the yarn from the edge. You might have to really pull to get it started, which might damage the yarn a bit. As you unravel, wind the yarn around something (a yarn swift or a couple of kitchen chairs). Otherwise, it will tangle on itself. When you're done, tie the loop of yarn in a couple of places. As cool as the yarn looks all kinked like this, it won't be much fun to knit with. You could, theoretically, wind it into a ball and knit it, but the kinks are going to make life harder. You want to smooth out the kinks. You could steam the skein, and for some fibres, that's all it takes. But for anything with silk or cotton, I prefer a good soak. Soak it in tepid water for a couple of hours. After it has soaked, and the kinks have mostly relaxed, carefully lift the skein from the water, gently squeeze out the excess water. 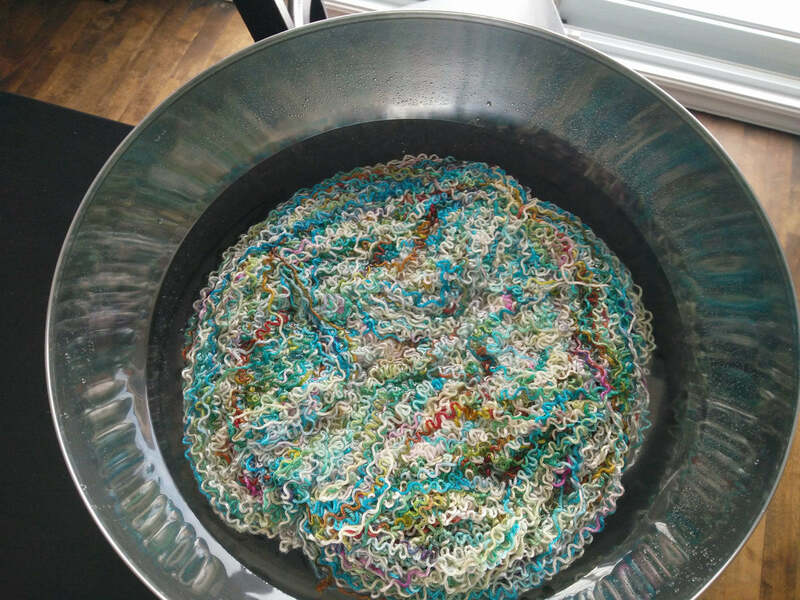 Be careful to keep an eye on where you've tied the loop; wet yarn likes to wrap around itself, and you'll have a tangle on your hands. Let it hang to dry, in a place where it can drip freely. When it's dry, you can twist your loop back into a skein, and you're ready to start over. Here we are, good as new.